Difficulty: Burlington Bikeway; Easy. Relatively flat paved rail trail. Colchester-South Hero Causeway; Easy. Flat stone-dust rail trail. Exposed to the elements out on the Lake. 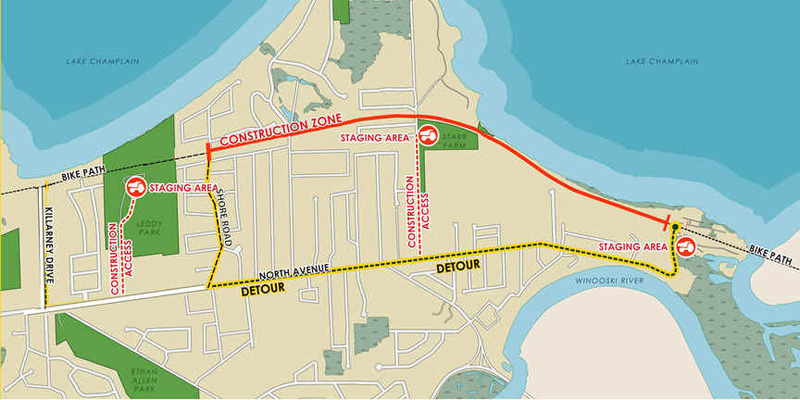 To Start from Oakledge Park; From I-189 westbound to Route 7 north. Travel less then a 1/2 mile to Flynn Ave and turn left. Follow Flynn Ave into the park and follow to the last parking lot. (Parking fee). There are many parking areas located along the trail. Most in Burlington have a parking fee. Airline/Causeway Park in Colchester has free parking. To Start from Airline/Causeway Park; From I-89 take exit 17 to Route 2 east. Turn right on Route 2 east/Route 7 south and follow for 3.1 miles. turn right on Bay Rd and follow to E Lakeshore Dr. Head left and follow to W Lakeshore Dr. Head right. Continue straight on Holy Cross Rd to Colchester Point Rd. Turn right into the park. The Island Line Rail Trail is comprised of the Burlington Bikeway/Lakeshore Bike Path and Colchester-South Hero Causeway. It follows the old rail bed of the Rutland RR-Island Line built in 1899 along the shoreline of Champlain Lake. In Colchester it juts out into the lake along a marble causeway before coming to a gap where a drawbridge used to sit. In order to continue on to South Hero you'll need to take the ISLAND LINE BIKE FERRY . For more information visit; ISLAND LINE TRAIL . Note; The Bike Path has been undergoing a rehabilitation since I last rode it. The first Phase has been completed from Perkins Pier to Penny Lane (widening, marking...) and the second Phase is currently underway in 2017. So some of my descriptions may be a bit off. CLICK HERE FOR CURRENT CONSTRUCTION STATUS . Starting from Oakledge Park; The trail begins on your right at the entrance to the parking lot. Note; The trail officially begins off Queen City Park Rd [0 Mile Marker] next to Pine St where a paved path travels north along a wooded corridor out to Home Ave at 0.4 miles. Here you head left on-road across the RR tracks then along Austin Dr (low volume/sidewalk available). Just before Dunder Rd on your left you'll pick up the paved trail on your right after almost a mile. This trail brings you to the Oakledge Park parking lot where the trail picks up from the opposite end of the lot at about 1.2 miles. Because there is no parking area from the start of the trail I began from Oakledge Park. Note; To your left is a picnic pavilion, restrooms and a paved trail which leads to a tree house and Lake Champlain. The wide paved trail heads north through the park (informational signs located along the trail) before passing a playground and picnic pavilion and traveling alongside a beach and the lake. The trail turns inland passing by the Burlington Earth Clock and crossing a bridge before coming to Harrison Ave at 1.8 miles. Turn right for a short on-road section (residential). At the end of Harrison Ave the trail paved picks up on your left and travels alongside the RR tracks. The trail travels alongside the lake at 2.4 miles and crosses a bridge over an inlet where it leaves the RR tracks as it hugs the shoreline. You'll pass by the Vermont Railway building at 2.8 miles. To your right will be some rail cars and a red caboose. Behind this building is a turntable (used to move rail cars to different tracks). Hold your nose as you pass by the sewer treatment plant. Straight leads to Perkins Pier, however the trail heads right out to Railway Lane where it picks up the RR tracks again. Bike maps available here in a holder. Cross Maple St and the entrance to Perkins Pier parking lot at 3 miles. At King St you cross over to the other side of the tracks. At 3.2 miles pass by the LOCAL MOTION Trailside Center where you can pick up a bike map, rent a bike or access bike tools and air. Next comes College St and the entrance to Waterfront Park. ECHO LAKE AQUARIUM & SCIENCE CENTER located here. Note; Across the street is an information booth located in an old or recreated train depot? Rest rooms and maps. Next to it is the Lake Street parking lot. From here you can access downtown Burlington's shops and eateries. At the top of College St (steep hill) sits the University of Vermont. The paved trail continues straight between the park and RR tracks. Cross Penny Lane and you'll head inland a bit leaving the town behind. At 4.4 miles the trail travels above the lake along a ridge before passing by the North Beach Park parking lot at 4.8 miles. The trail heads into the woods passing through a rock cut and traveling underneath Rock Point Rd. Pass by the Leddy Park parking lot at 5.7 miles and enter a more residential corridor. After crossing Starr Farm Rd you'll pass by the Starr Farm Dog Park before skirting the lake again. Cross the Winooski River Bridge at 8 miles. Beautiful old RR trestle overlooking both Lake Champlain to your left and the Derway Island Natural Preserve on your right. A cement boardwalk then takes you through Delta Park and out to Windemere Way at 8.5 miles. The paved trail follows this road through a residential neighborhood to Biscayne Heights. Head left on-road (still residential) out to a crosswalk over Colchester Point Rd. This brings you to the Airline/Causeway Park parking lot at 9.1 miles. Restrooms located here. This is the start of the Colchester-South Hero Causeway. Head left along the stone-dust trail paralleling Colchester Point Rd before following a causeway through a scrub marsh. Wood mile markers located every 0.5 miles. Cross Mills Point Rd at 10.1 miles. To your left just down the road is the Cross Mills Point Road parking lot. After passing through a wooded corridor you enter Causeway Park and the marble lined causeway at 10.5 miles. The causeway heads straight out into Lake Champlain, passing by Law Island on your left. You cross the Law Island RR Bridge at 11.3 miles. Be aware you can encounter breezy conditions and headwinds. Pass by the ISLAND LINE BIKE FERRY and come to the 200' gap in the causeway (Used to be a RR drawbridge) at 13.1 miles. In order to continue your ride to South Hero you'll need to utilize the Bike Ferry. This is as far as I traveled. After arriving on the other side of the causeway from the Bike Ferry the stone-dust trail continues along the causeway. The trail hits Allen Point and skirts South Hero coming to an end at Martin Rd after 14.4 miles. Martin Road parking lot located here.